Asian-Hawai'ian arts of health and restoration. Danzan Therapeutics is a strategy of eastern and western principles that work to remove pain and restore your body to vibrant health. DZT utilizes medical, myo-fascial and myo-skeletal, bodywork techniques that effectively address soft-tissue problems as well as methods to resolve neurological disfunction (such as nerve entrapment). It draws on Asian acupoints, energy flow and herbal treatments. We also look for and address psycho-emotional factors that may be contributing to pain in its physical form. The methods used to achieve lasting results are often a combination of corrective exercise, bodywork techniques and herbal remedies. The goal being to restore health and freedom from pain via the least invasive, least repercussive and least-costly approach. 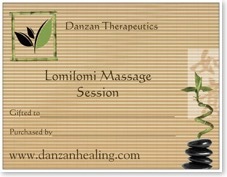 Danzan Therapeutics draws from corrective bodywork techniques, flowing and gentle massage, neuro-linguistic visualizations and integrated body re-education in an effort to resolve pain and disfunction. Learn more! Less Pain with Less Risk! Who doesn’t want to feel great for their birthday? Purchase Gift Certificates!